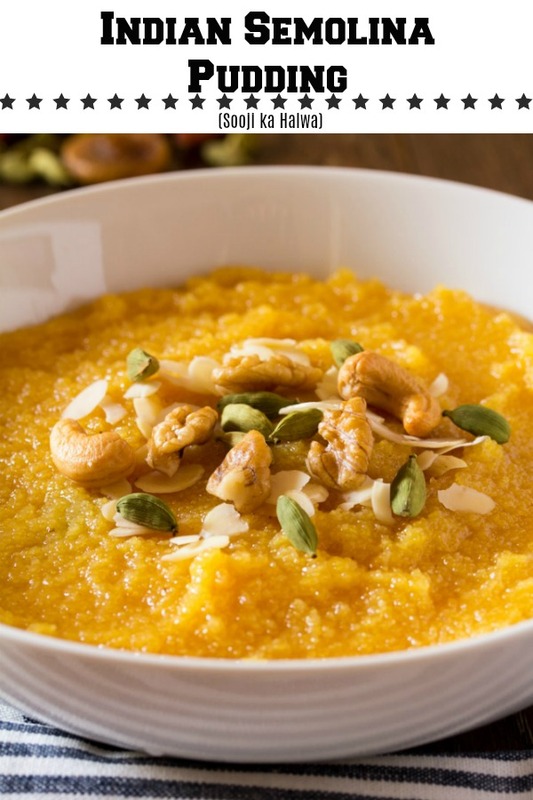 Suji Ka Halwa (Indian Semolina Pudding) is a sweet dessert often made for auspicious occasions in India and in Pakistan it is served with a famous weekend brunch food called halwa poori. 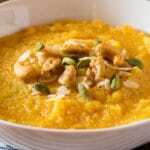 It is also called rava kesari or rava sheera in some areas of India. 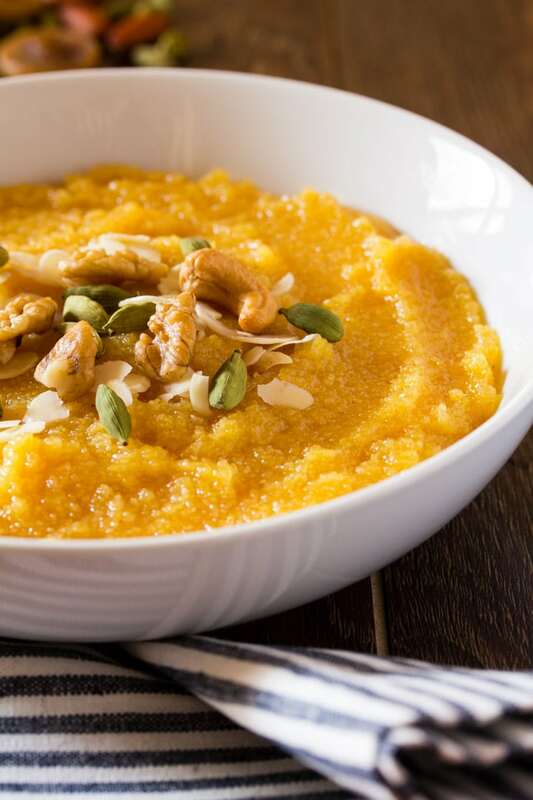 Topped with dry fruit, Suji Ka Halwa is an easy, comforting and delicious dessert from the South Asian region. I’m here with a delicious Indian dessert that’s super indulgent and super easy to make. But let’s first start with a brief explanation of what exactly semolina (rava) is. Even I didn’t know this until recently. Lol. So basically, semolina is derived from the middlings of wheat durum and is also used to make pasta and couscous. 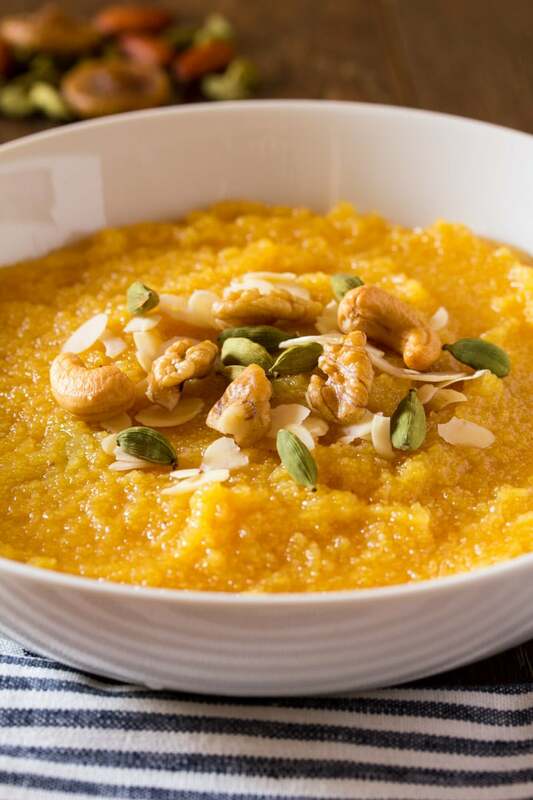 In countries like India and Pakistan, it is primarily used to make this suji ka halwa (rava sheera). And boy, is it yummy or what?! Not to mention it’s super simple to make which is just the way I like it here. In India suji halwa is made on auspicious holidays an also used as a prasad. In Pakistan however, it is served as a brunch dish along with pooris, aaloo bhaji (potato curry) and channay (chickpea curry). It’s a super filling brunch and is often paired with hot cups of milky tea. Yum! So today I’m going to teach you how to make this divine suji ka halwa. Each household has it’s own way of making suji ka halwa, and while I usually make one with butter and milk, this one is a bit different as we use water and sugar to make a sugar syrup and then add the semolina. This particular recipe is served with pooris and usually very indulgent so just a little bit goes a long way. This is a very, very easy semolina pudding recipe but there are a couple of tricks to make sure that it reaches the perfect consistency. Often with semolina pudding, what happens is that while it’s deliciously soft when it’s freshly made it becomes a bit stodgy as it comes to room temperature. However this suji ka halwa recipe is different as its consistency remains the same even as it cools down. The beautiful orangey color that you see in these pictures comes from a couple of drops of orange food color. However this is totally optional, and you can skip it if you want to. But don’t forget to add a variety of dry fruit because it makes the suji halwa even more delicious with added crunch and texture. We start by making the sheera (sugar syrup) which is simply made by combining 2 cups sugar with 3 cups water and cooking just until the sugar has completely dissolved. At this point you may also add a few drops of orange food coloring if desired. The sugar syrup will have a very thin consistency. Take off heat and set aside. In another large pot, start by heating 1/2 cup ghee (clarified butter) or butter. Add a few crushed pods of green cardamom. Then it’s time to add 1 cup of semolina and cook for just 2-3 minutes and not anymore than that. Once the semolina is cooked, pour in the prepared sugar syrup and then cook for only 2 or 3 minutes and remove from the stove. The halwa will still be very liquidy but will be bubbling, that’s exactly how it’s supposed to be. Cover with lid for 10 minutes. When you take off the lid of the pot, you’ll see that the semolina has absorbed the extra liquid and the halwa is now ready to be enjoyed with poori or even on its own. 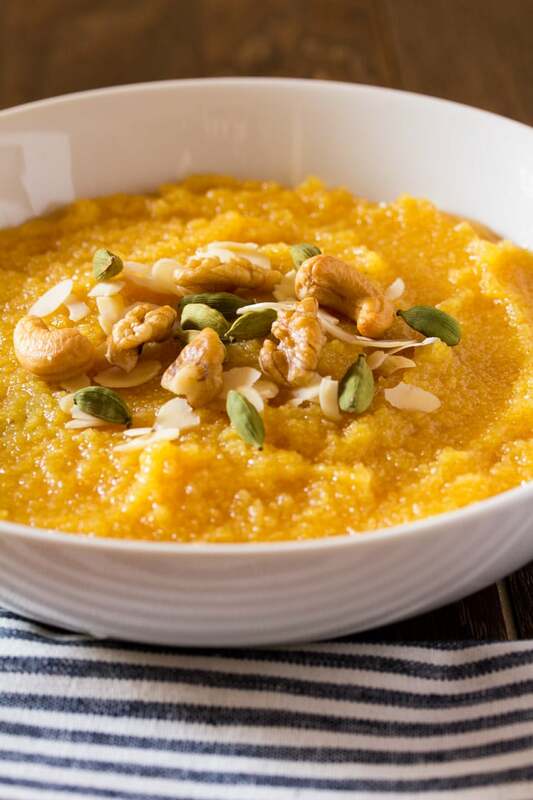 Learn how to make easy Suji Ka Halwa (Indian Semolina Pudding) which is an easy semolina with sugar syrup dessert topped with nuts. Served on auspicious or religious occasions in India and also served with poori. In a medium sized pot add all ingredients and cook just until the sugar has completely dissolved. Take off from heat and set aside. In a large heavy based pot, heat the ghee (or butter) and add the crushed cardamom pods. Add the semolina (suji or rava) and cook for 2-3 minutes until it releases a nutty aroma. 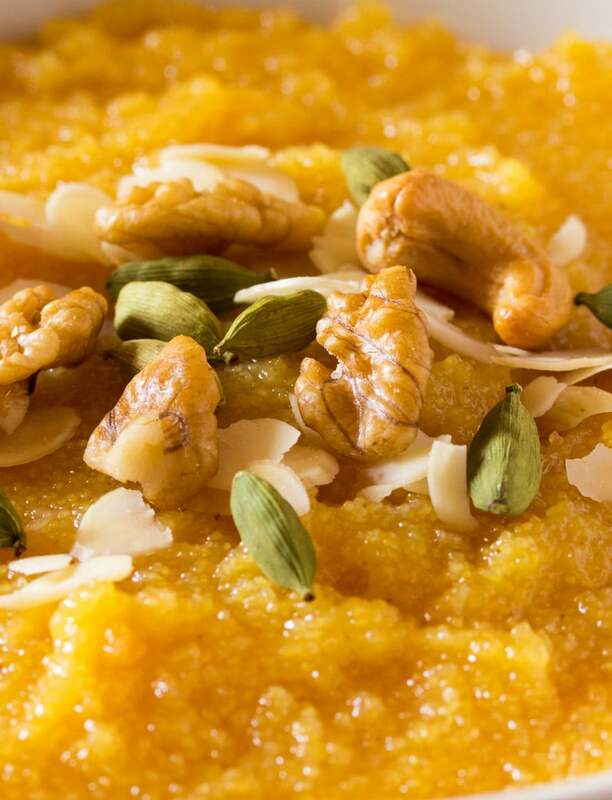 Pour in the sugar syrup and cook the suji ka halwa for 2-3 minutes. The halwa will still be very liquidy and bubbly. Do not cook any longer than 2-3 minutes and take off heat immediately. Cover with lid and let rest for 10 minutes. After 10 minutes the semolina will have absorbed extra liquid and be in perfect consistency. Top with nuts / dry fruit and serve on its own or with poori. Thank you for all your tricks and tips! Makes me feel more confident when trying new things! Yum! This sounds perfect paired with curry and tea for brunch! I love the assorted dried fruit on top. I really love the time you took for all these tips. This isnt something I ever had and would love to try it. The colors are so vibrant! Sounds like something the kids will love too! Wow! I’ve never tried this but it looks and sounds so good! I’m saving this for later! What a creative pudding! I am going to have to try this out very soon! It looks very good!